Vale Edwin Harry Medlin B.Sc.(Hons. ), Ph.D., D.Univ. Harry Medlin was born at Orroroo in country South Australia on 2 January 1920. He attended school in Adelaide and studied at the South Australian School of Mines and Industries from 1936 to 1939, while working at the Adelaide Electric Supply Company. He enlisted in the Australian Army in 1938, was commissioned in 1939 and rose to the rank of captain at the age of 20. He was a prisoner of war of the Japanese in Timor and Java from 23 February 1942 to 23 September 1945, and was awarded the Efficiency Medal and five campaign stars and medals. On leaving the Army in 1946, he commenced studies at the University of Adelaide under the Commonwealth Reconstruction Training Scheme. He graduated Bachelor of Science in 1949, took Honours in 1951, and completed his PhD on X-ray crystallography in 1956. He was appointed a Lecturer in Physics at the University in 1951, gaining promotion to Senior Lecturer in 1960 and Associate Professor in 1974. He retired in 1985, but remained a strong and lively presence in the University community, especially the Alumni Association, which he helped found, becoming the Inaugural Chair. Harry Medlin was an active and loyal supporter of the University in many ways. He served for many years on the Education Committee, and was inaugural chair of its Executive Committee from 1980 to 1982. He contributed actively to the governance of the University through membership of the Senate Standing Committee from 1965 to 1980, and the University Council from 1967 to 2003. 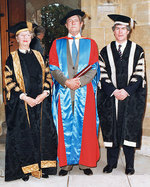 He was Deputy Chancellor of the University from 1978 to 1997, and was awarded the degree of Doctor of the University in 1987, and the Centenary Medal for his creative and productive involvement in all aspects of the work, life and culture of universities in 2001. His wider interests in the University community included the University of Adelaide Staff Association and the Federation of Australian University Staff Associations, the University of Adelaide Theatre Guild, the Adelaide University Union (the students' association of the University), and many more groups and causes. He held executive positions in many of these associations over the years. He was especially active in the alumni affairs of the University in South East Asia, where he maintained many lifelong friendships, and travelled widely to develop contacts with graduates and establish alumni chapters. From left, Dame Roma Mitchell Dr Harry Medlin and Professor Kevin Marjoribanks. From left to right, Dr Gerald Laurence, Dr Harry Medlin, Professor Graham Nerlich, Dr George Mayo, and Professor Donald Stranks, Vice-Chancellor, at a Theatre Guild production.